Don't you think it is amazing when you read about companies who do something more than their brief? Companies who go that extra mile to make those less fortunate than ourselves better off? 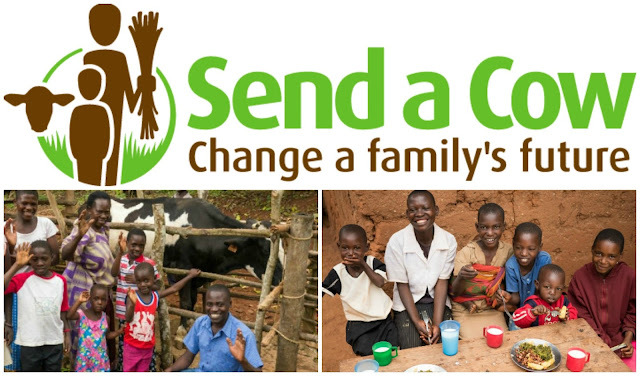 Send a Cow are a UK based charity, help thousands of families in Africa. By helping those families to grow enough food to eat, sell what they grow and develop a small business that lasts. Farming is no longer enough for a family to just 'get by' if we want to offer hope for generations to come and that means by having their own small business, their income begins to grow and with that increased income are opportunities. Those opportunities give families a chance to invest no only in farm improvements, new livestock and equipment, but also in their children's education, something many of us are lucky to have but perhaps take for granted. Finally, we have the brilliant site known as Bath and Unwind which is one of my favourite websites for browsing when I need inspiration for gifts because they have an amazing selection of products to choose, from an amazing range of brands. As a beehive has been donated to Africa in my name via Send a Cow and the lovely people over at Bath and Unwind have very kindly gifted a Burt's Bees Naturally Bee-utiful Collection Gift set in keeping with the Bee theme, for one of my readers to win, all you need to do is complete the Rafflecopter widget below. I am a self employed photographer and for each of my wedding clients I gift a tree to them. A sapling is planted in their honour and helps to reduce the carbon footprint of their wedding. What a great organisation. I am a little bit obsessed with Burt's Bees too! Great to see organisations doing there bit for others what a great thing to be a part of. I really love the ethos of this bank. Companies don't HAVE to be ethical but it is good business practice if they are! It's lovely for large organisation to give something back! A great initiative! wow I have never heard of triodos bank before! but it seems like they are doing a lot of good with their projects!! I've heard a lot about Send The Cow before and think it is a fantastic organisation! Great ethos for a bank - another good comp too! Love when huge brands give back. So cool. This sounds like a great ethos for a bank and would make me give them my custom above others. It's important to give back. Such a great organisation. I love brands that give back! A fantastic business concept. I hope their efforts yield some real change. It is no wonder that you like Burt's so much, it is very rare to find a skincare brand that gives back to the community and concentrates on improving society rather than financial profit! It's great to hear about a bank making an effort to do good. The Send a Cow initiative sounds great! It's great to read about Triodos bank. I knew of them already because my children went to our local Steiner School and part of the new build fund was a loan from Triodos. They are such a great ethical company! so nice to know that companies are giving back. This is a great charity to support. It's always lovely to see companies giving back to the world. Awesome! I've never heard of any of these before. Thanks for sharing! I can totally get behind on this idea - I think it's beautiful when companies want to do more and give back.